So now we're only 3 days away from the start of the biggest wrestling weekend of the summer and quite honestly I'm personally more excited than I was for WrestleMania weekend. Yes, we had Takeover: Dallas and the biggest WrestleMania of all time but the feeling I had going into was one of concern, especially with all the injuries WWE were plagued with at the time. Bayley is quite possibly one of the best assets WWE has. She's fantastic in the ring and she shares a connection with younger fans that many people lack. It was a big surprise when Sasha Banks, Becky Lynch and Charlotte were all called up and she wasn't but in the long run it was the right move. NXT needed someone to be the flagbearer for the Women going forward and Bayley was the right choice. Now that Asuka has become integrated into the WWE system the time is right for Bayley to move up. Any fears WWE had about her ability to get "over" on the main roster would've been proved wrong when she made a one night appearance at Battleground a month ago. This may end up being the age old tradition of the old guard putting over the next torch carrier. I went back and forth on this one a little because I can see both men walking away as rightful winners. Samoa Joe is in a similar position as Bayley. Despite the fact that Joe hasn't been Champion for very long there's not much he can do in NXT after his feud with Balor. He's one of WWE's best heels all round and he'd do a smashing job on RAW or SmackDown as a top player. On the other hand, I wouldn't complain if Nakamura walked away the loser and turned up on the main roster in the following days or weeks. Shinsuke Nakamura is arguably WWE's most popular act right now simply because he's that good. At 36 with the reputation he had in Japan and WWE's interest in branching out into new audiences it wasn't likely that Nakamura would remain in NXT for long. Now might be the time WWE pull the trigger and decide he's ready. On to SummerSlam and this one is one of the most touted things that could happen and it's understandable why. New Day have done just about as much as they can as the champions. Gallows and Anderson are legitimate challengers to New Day and there isn't much more to it than that. New Day isn't going to be around forever so this could be when the seeds are planted for when they go their seperate ways. But who knows, maybe New Day chasing Gallows and Anderson for the titles could be a compelling story to tell. If I had to pick one result that I wanted to happen above everything else this weekend, this would be it. Yes, Styles is older than Cena but he's the new guy and will be a focal point for SmackDown for the next couple of years. Cena is a 15 time WWE Champion who is branching out into different areas. 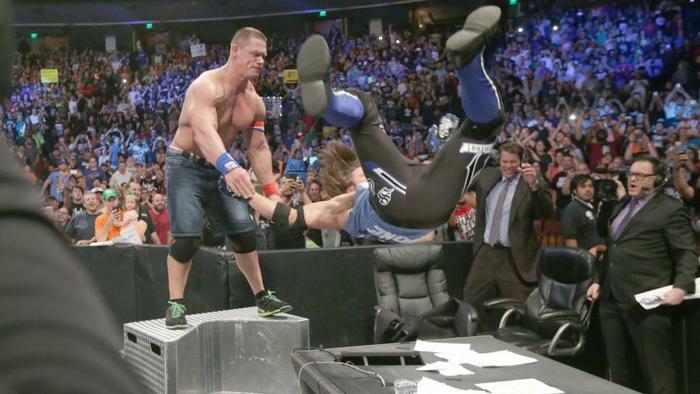 Clean defeats for John Cena are saved for special occasions and this should be one of them. A win for Styles over Cena would be only his third PPV since joining WWE and beating John Cena would be a major statement. Cena beating Styles on the other hand means that neither man gains anything. Cena will likely take time off to film American Grit and Styles will continue on. I have no doubt this match will be excellent but the booking is crucial. If WWE get it wrong they will face inevitable backlash. This one is predicted by many to be match of the weekend and It's easy to see why. Seth Rollins is the complete package and Finn Balor is the hottest new act on WWE TV. Either man walking out as the champion would be absolutely fine but in my mind, Balor is the logical decision. The winner of this match will be looked back on through history as the first ever champion. If WWE treat Finn Balor's "Demon Persona" as a big deal then that instantly causes the title to seem big. Not to mention that if Rollins loses to Balor all it does is add more to his character. The whiny heel Rollins will have yet more reasons to complain. I don't agree with this and I absolutely think it's the wrong decision but I can see it happening. Whether it be by interference by someone like Goldberg to set up a future match or if Orton simply pins Lesnar to the mat cleanly, making Randy Orton the man to beat the one in 21 and 1 would be an example of WWE not thinking straight. It's clear that ending the streak will always be one of Vince McMahon's most regretted decisions but he must make sure he uses Brock Lesnar in the same way he did Undertaker. Randy Orton is a 12 time WWE Champion. He is already a star in his own right. He doesn't need the rub from being the one to beat Lesnar. Imagine what beating Lesnar could do for a guy like Kevin Owens. Imagine Owens going around every week making a big deal out of how he beat Brock Lesnar. Nobody will gain anything if Orton wins. He will go back to SmackDown the same guy and Lesnar will leave again until January. This is another pivotal decision this weekend. WWE must get it right.